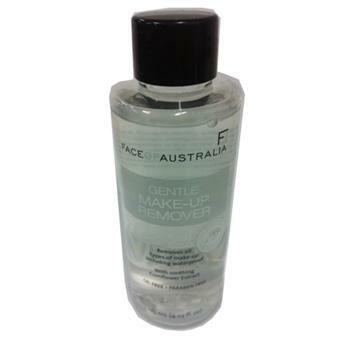 This Gentle Make-Up Remover by Face of Australia is a dual phase formula containing no Oil or Parabens. This Gentle Make-Up Remover Lotion is an innovative "tear Compatible" pH sensitive formula that is perfect for all skin types particularly those with very sensitive skin or eyes. Shake vigorously till phases have combined, then apply liquid onto cotton pad. Wipe gently over face beginning with closed eyes, being careful not to rub make-up into the eye area.